Back in 1979, my heart was set on traveling south about 5 hours from Bellingham, WA, and seeing the total eclipse of the sun in the town of Goldendale, near the Columbia River in Eastern Washington. Due to circumstances that I thought were beyond my control (it's a long long story, but I have since realized that I had more choices then than I thought I did at that time), I witnessed only a partial eclipse here in Bellingham, WA. The morning light from the cloud-hidden sun did dim somewhat and then brighten again to become simply overcast, but that was all that happened. I grieved and resented my circumstances. "I had seen a partial eclipse in 1970. A partial eclipse is very interesting. It bears almost no relation to a total eclipse." "Abruptly it was dark night, on the land and in the sky. In the night sky was a tiny ring of light. The hole where the sun belongs is very small. A thin ring of light marked its place." I was 29 years old, and that was during an extended period of darkness in my life that had begun in December 1970 when my boyfriend brought the war in Vietnam home with him. We were 21 years old. That darkness lifted in 1987 with my one-day-at-a-time recovery from a severe and unrelenting depression that had been caused by a combination of my life circumstances, alcoholism, bulimia, and anorexia. Even these dark times today are not as dark for me as those years between 1970 and 1987 when I had very little light within me. That little light of mine was close to going out. If not for a first cousin who lives in Florida and perseverance and good fortune, I may have missed the eclipse on August 21, 2017. In the spring, my cousin emailed and asked if I was planning to travel to see the eclipse. I've been so focused on making a living and paying my bills that I had somehow missed all the clues that the total eclipse I had waited 38 years for was coming up. A few minutes after receiving her email, I went on the internet to see if I could get a motel room in Albany, Oregon, on the I-5 corridor, in the path of the eclipse. To my surprise, I found out that I could get on a waiting list only, that motel rooms in the path of the eclipse had been booked up to a year in advance. In discouragement, part of my mind began to tell me that old old story that circumstances were beyond my control. My fertile and creative mind, however, went to work behind the scenes. Soon I had another plan. I could take the back roads and the Coupeville-Port Townsend ferry to the Olympic Peninsula and drive to Olympia on August 20. There were motel rooms available in Olympia. On the morning of the eclipse, I could get up early and drive to the path of the totality. I wouldn't even have to drive all the way to Albany. After securing a motel room in Olympia and thinking everything was good to go, I began to read about the predicted traffic jams on I-5, and my mind went back to the old old story, "Too bad for you. You're just too late. These are circumstances beyond your control. Just accept them. Sure, you can go to Olympia, but you'll probably not make it to the path of totality and if you do, the traffic will be a nightmare." Abandoning hope for that plan, I cancelled the motel room in Olympia. 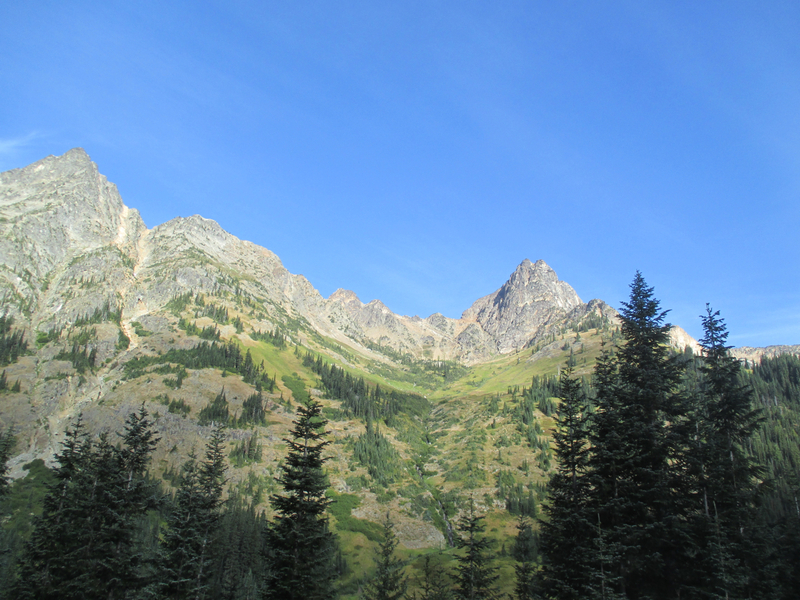 Despite my conscious pessimism, my unconscious mind went to work again and soon came up with a third plan of driving across the North Cascades Highway to the town of Wenatchee in Eastern Washington on the day before the eclipse and staying overnight there. On the day of the eclipse, I planned to drive to the small town of Fossil, Oregon, and then back to Wenatchee the same day. I had no trouble getting a motel room in Wenatchee on August 20. Again, I was convinced that I was good to go. Eastern Washington and Eastern Oregon are lightly populated. How much traffic could there be? 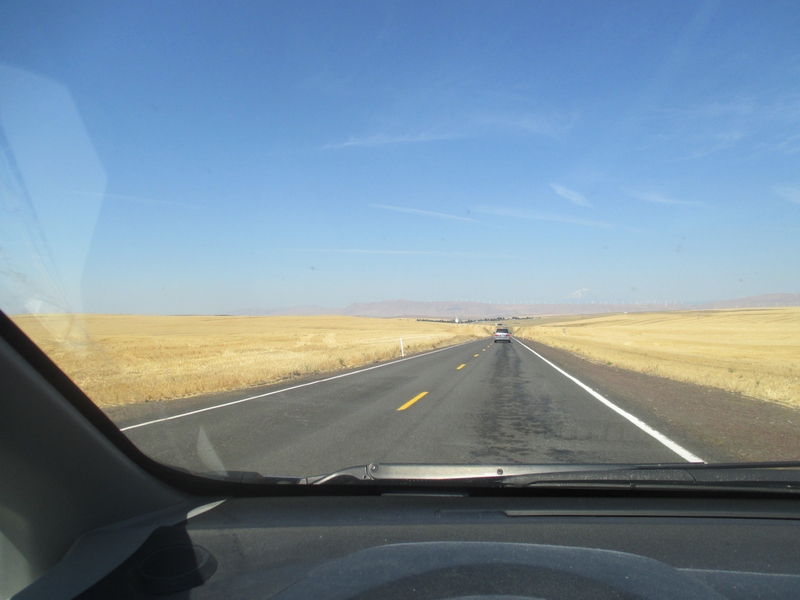 I looked forward to the spectacular drive across the North Cascades, to seeing the clear blue skies east of the mountains and above the Columbia River with its surrounding formidable golden hills in that part of Eastern Washington and then on to the vast bright golden rolling wheat fields of Central Oregon. And so many stars at night! Orion! As the eclipse approached, the news on the internet became more and more negative in terms of horrific traffic jams and disaster areas in the path of the eclipse. I began to doubt my plan. The old old stories began to play in my mind. Not a single friend or neighbor expressed any serious interest in traveling to see the totality, but they wished me well on my journey. On the night before I left for Eastern Washington, I told myself that I would get as close to the totality as I could, even if traffic prevented me reaching my destination. The news had convinced me that I might well be hindered by a traffic jam and surviving that, I would arrive at the chaos of too many people and not enough services. I was prepared to stop short of all that or, if it happened suddenly, I would turn around and find a more peaceful place some distance away and content myself with seeing a partial eclipse, knowing I had done my best to see the totality. 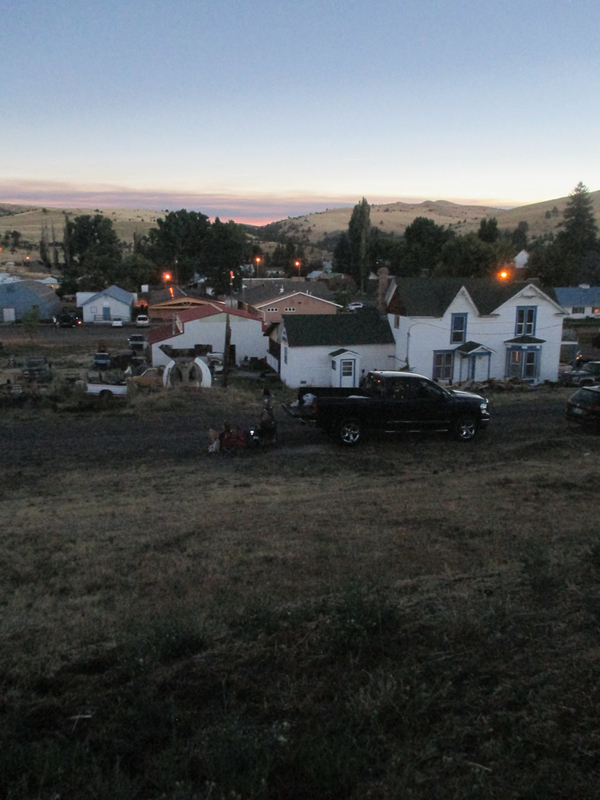 For the morning of the eclipse, I set my alarm clock for 2 a.m. By 2:30, I was driving south on Highway 97. The sky was clear and filled with stars. Orion accompanied me to the dawn. All the way to Fossil, Oregon, the traffic was light. There weren't all that many people who had driven to Fossil that morning. When I arrived, it was quiet and peaceful. Some of the visitors had arrived on previous days. The town of Fossil had designated areas for setting up camping tents. Those areas were not crowded. There was no commotion. The clear fresh quiet sparkling feeling in the air and the golden rolling hills brought me back to my first memories as a child, living in a small town in the San Joaquin Valley of South Central California between 1954 and 1957. Although there was a distinct sense of something being wrong in my life and the lives of my parents (angry mother, depressed father), I felt joy looking up at the sky and seeing the golden rolling hills. By the time I was 5 years old, my little light had been inexplicably diminished. I don't know exactly what had happened to me, but I was a sad anxious lonely child with little self-esteem. I remember looking in the mirror and thinking I was getting old and ugly, and that no one would every marry me. 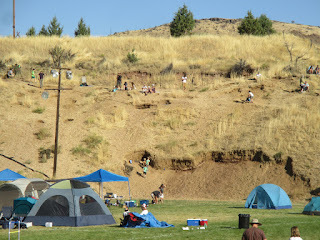 While waiting for the eclipse, many of us walked around the small town in morning sunlight, and some of us made our way over to Fossil Hill behind the town's high school after reading informational signs indicating that it was a source of plant fossils, including that of Metasequoia (Dawn Redwood). 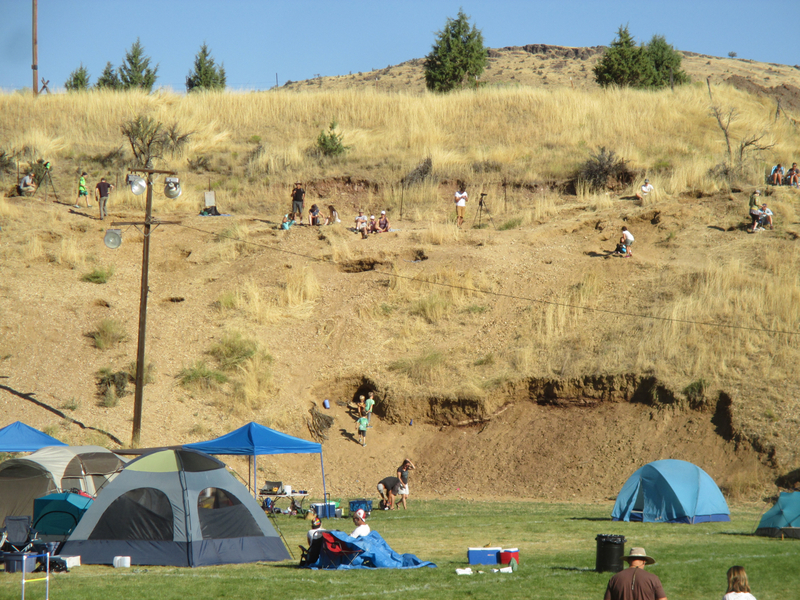 I paid $5 at the beginning of a narrow path that led to the hillside above the high school field where visitors had set up their tents and walked along the path and up the hillside. A little girl was explaining to the visitors about the fossils. She showed me a leaf fossil and gave me suggestions to help me in my plant fossil search. I sat down with my back to the sun and started gently digging with a flat rock and with my hands. Within a few minutes, I thought that I had probably found a Metasequoia fossil from possibly 150 million years ago. 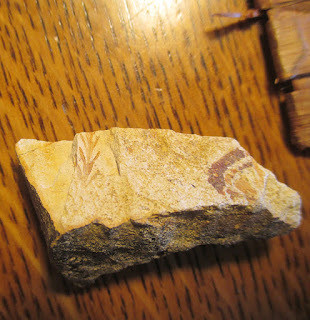 When I showed it to the little girl, she confirmed that it was what I hoped it was and said that few people found the redwood fossils. Redwood trees are dear to me. 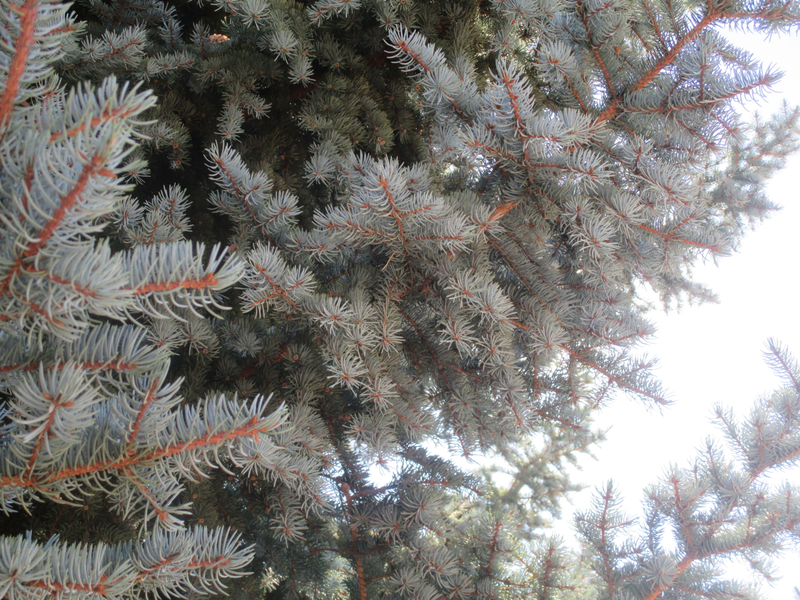 I grew up with Redwood trees. I'm still in awe of my find. The eclipse was still to come. I walked back to my car to drink some water and find a good spot for watching the eclipse. A very few of us chose to sit on a hillside facing south. Most people sat with their faces toward the sun. I sat in the shade of a tree because the sun was already hotter than I am comfortable with. I could see the sun through the branches of the tree and by leaning forward and looking up to the east at intervals, could easily watch the moon pass over the sun with my eclipse glasses. Gradually the landscape took on an odd color only seen during eclipses, as less and less sunlight could travel to the earth at the spot where we were sitting. I remembered experiencing something of that dimming light from the partial eclipse in 1979. For me, it was not as Annie Dillard had described in her essay. She called the light platinum. To me the light was something like that of color photographs from the 1950s whose color has been altered by time, but that description is only an approximation of the peculiar light. Nothing could have completely prepared me or any of us who had not experienced a total eclipse previously for the startling moment of the totality. Here is a photo approximation from the moment before the totality and the totality. If you've watched the video at the top of this post, you've heard the awe and wonder in the voices of some of the people who witnessed the eclipse. The darkness didn't last long. As abruptly as it had arrived, the darkness was gone, and the landscape gradually brightened until it was just as before, under the sun as we usually experience it. I wish you could have seen the children dancing with delight. I wish you could have seen the little boy of 4-5 years old who looked at me and smiled and said, "Epic!" Here is what I saw after leaving Fossil and beginning my journey north. I wish you could see the radiant light of the wheat fields of North Central Oregon. This is just an approximation of that light. "Tribal members fished the Spokane River, the Columbia River, and utilized the grand Spokane Falls as a gathering place of family and friends." I hope you will read this book that was written two years after the death of his mother. He writes with love and grief about his relationship with his angry mother and his depressed father (who were so much more than their anger and depression) and the circumstances of their lives and the lives of native people since the arrival of the Europeans. 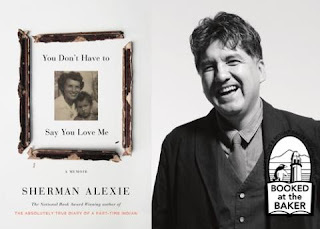 Sherman Alexie has been in darkness darker than I have known, and he has much to say about surviving against all odds through centuries of trauma and grief. He identifies as an atheist and writes about the presence of grace. What an extraordinary and wonderful story am, in so many ways. In recognizing but not being taken in by the old old story, in getting up so early and driving through the landscape and of course, in finally managing to see the total eclipse. What an adventure, success, through courage. And I do so much like Annie Dillard's writing. My American partner (ex) introduced me to her Pilgrim at Tinker's Creek in the 80s as it was written about a place he knew well. Many good things he brought me. So glad you saw the eclipse. I have only seen a couple of partial ones. This made me so happy, reading how you experienced the eclipse. I will definitely check out the Sherman Alexie book, too. I am so happy for you that your perseverance won the day and that you could experience this magical event. In August 1999, we were almost in the path of the total eclipse that took place in Europe. I remember racing on my bicycle from work to meet up with S who had walked with her entire school to a nearby park where they were all sitting on a hillside looking up. But I was late, coming from work, and actually experienced the entire event while cycling, the birds gathering in the trees above me, their noise dying down, the wave of darkness sweeping over everything and the gradual beginnings of bright daylight again, a flock of birds lifting from the canopy in front of me. Meanwhile R had been on the road for hours with a group of students, heading towards Belgium to be even closer. Almost there, zhey got stuck in gridlock on the motorway and watched the eclipse flat on their backs on the tarmac, looking up. We actually drove to the spot afterwards to make it less unreal, hundreds of people lying flat on their backs on a motorway. Enjoyed reading your account and seeing your photos, am. 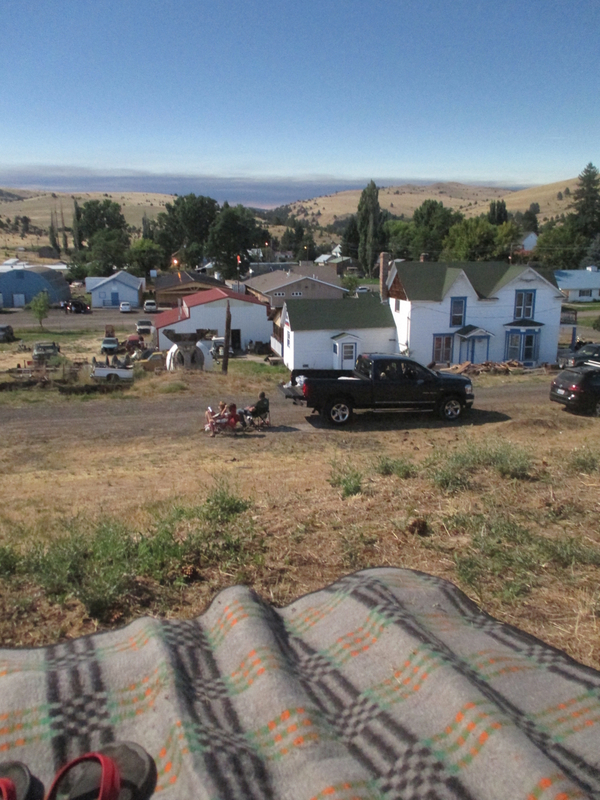 I've visited Fossil a couple of times over the years, and that area from the Gorge down through central Oregon - the wheat country, the salmon rivers when native peoples were fishing in autumn…. Love that you found a fossil that has meaning to you! Sounds like a very special pilgrimage to see the eclipse. I read your beautiful comment on Sabine's post and clicked over here to your equally beautiful blog. I had thought I was long finished with starting new blogs, but I'm excited to find you -- seemingly a kindred spirit. I look forward to reading through your posts, but I can't believe that in this one, long one (including your comment to Sabine), you quoted from Sherman Alexie, Annie Dillard and Bob Dylan -- all of whom I adore and have been prevalent in my mind because of the eclipse and his new memoir and that exact line! What are the chances? I suppose there are no accidents. dritanje -- Thank you for taking the time to read my eclipse story! Reading Annie Dillard's Pilgrim book was life-changing for me when I read it in my mid-20s just after it was published. She came here to Western Washington University to teach soon after that. I was fortunate to be able to hear her give a talk at the university. Her writing has touched so many of us. Colette -- Thank you for sharing your happiness and for your presence! Sabine -- What a wonderful story about your experience of the 1999 eclipse from your bicycle and to think of R and his students and all those people lying on the motorway! bev -- That makes me happy to know that you have been in Fossil, too! There is a good feeling in that small town, so far from the commotion of cities. Something in me is deeply in love with the landscape to the east of the Cascades -- the vast fields, the rivers, the shape of the land, the clarity, the stars at night. Elizabeth -- Welcome! Plenty of kindred spirit connections. That's for sure. Thank you for commenting!